January 29, 2019 - Coral Springs, FL - New Found Glory fans are celebrating today after the band has announced The From The Screen To Your Stereo To Your Town Tour!! They will be joined by Real Friends, The Early November and Doll Skin for a stacked lineup that will be taking off across the United States beginning on May 30th. 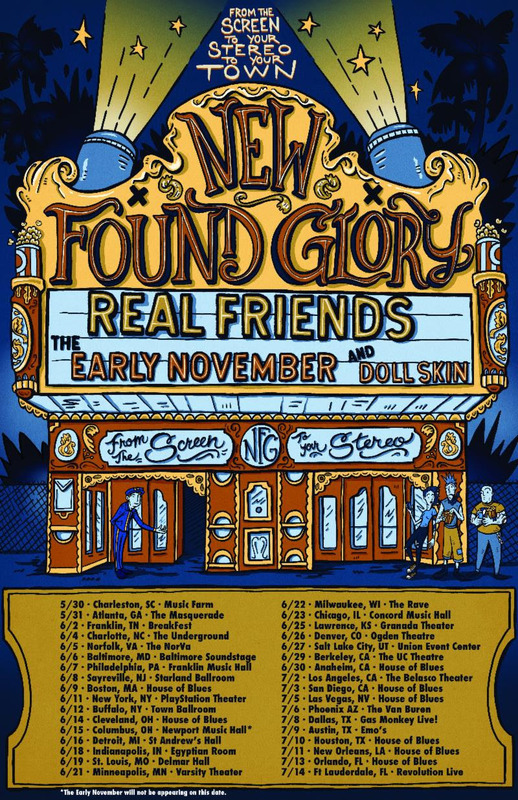 Pre-Sale tickets and Super Fan Bundle Packages are available now at newfoundglory.shofetti.com with general tickets on sale Friday, February 1st. As if this wasn't enough of a reason to celebrate, New Found Glory also finally announced the release date of From The Screen To Your Stereo 3. Due out May 3, 2019 via Hopeless Records, the album is the third installment of their fan-favorite nostalgic movie cover records. From The Screen To Your Stereo 3 will feature very unique NFG versions of movie themes like "The Power Of Love" from Back to The Future, "Let It Go" from Frozen and "Eye Of The Tiger" from Rocky 3 as well as 4 more theme song hits! Pre-order details have not been announced yet. The From The Screen To Your Stereo To Your Town Tour will include a very special stop in Franklin, TN for the second annualBreakFEST, a full day festival showcasing not only music but the most important meal of the day - breakfast. Taking place on June 2, 2019, the event will be held inside The Factory. Bringing together both old and new friends in the music scene like Mae, Hawthorne Heights, Microwave, Jetty Bones, Love You Later, Doll Skin, H.A.R.D. and tour mates Real Friends andThe Early November, BreakFEST is just another way that New Found Glory continues to find unique ways to connect with their fans and their local communities. For more information, please go to http://breakfest.net/.